Psion provides innovative and rugged mobile computing solutions with focus on the following industries: Airports, Automotive, Cold Chain, Field Services, Public Sector, Passenger Management, Ports and Container Yards, Postal and Courier, Retail, Warehouse and Distribution. 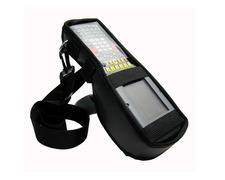 System Wear is able to develop a customized solution to carry your Psion handheld device. Please consider us for a custom designed after market solution in order to meet your organization exact carrying needs.